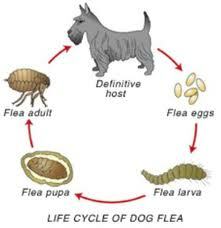 Because flea infestations involve multiple life stages, an effective treatment strategy targets as many stages as possible. If you believe your pet is infested with fleas, begin with a trip to your veterinarian. Your pet may have a skin infection or other problem that needs attention. Once your pet has been examined, your veterinarian can recommend a safe and effective product that you can use to kill the fleas. Some products specifically target adult fleas, while others also target the immature stages, like eggs and larvae. Regardless of what product is used, multiple treatments are generally required to completely eliminate an infestation. If you have multiple pets in your home, each animal should be treated with an appropriate product. In some cases, the house may also need to be treated to exterminate fleas. Products are also available for treating the yard and outdoors.